Anyway, over the past few years, my thoughts on the issue of the "double hip" have changed subtly - but significantly - and I thought I'd elaborate on them. Yes, I've railed against the emphasis on "koshi" - hip use in kata very strongly. Why? 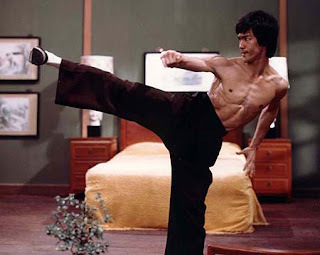 It seemed to me that it had become quite popular to practise this kata with a hip pre-load on every movement. Those who didn't do so (eg. 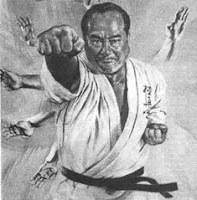 JKA shotokan) were derided as lacking understanding or knowledge of the "true essence" of karate. I don't like fashion or dogma and I tend to argue the opposite out of principle. But I have, over the last 2 years, come to see that the "double hip" does have a function. Even I have used it over the years. So I'll now outline a case for using the "double hip". A big part of my own journey into the martial arts over the last decade has involved training with my esteemed teacher, mentor and friend James Sumarac. It is he who really shed light on this whole issue of hip use. James is nothing if not a master at using his hips to power his strikes, deflections and generally his whole body movement. It's important to stress here what I mean by "hip use": James can use his hip from whatever position they might be in - to generate incredible force behind his movement. He doesn't have to "pre-load" anything. His hips snap into action with a single move - and BANG, the force is applied. It comes into its own as a training device - not a literal application. We want to ensure a full range of movement. The same applies to basic deflections, blocks, parries ("interceptions" as I called them a while back). That's why the movements are "big". You train them "big" because you're training them "fully". You're exploring the full range of motion, not some smaller range. It's very hard to practise anything when the movement involves a tiny linear movement of 5 cm - or a circular movement with a diameter of 10 cm. 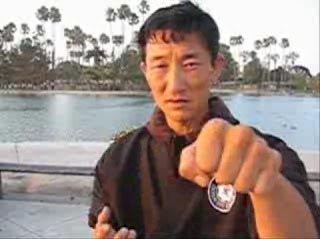 This is true whether you're punching or doing "single whip" in taijiquan. Accordingly, movements in solo form practise that are small in application are invariably either left out of the solo form (and then forgotten), or they get exaggerated. The latter stands to reason: if you don't want to forget small movements you might default to making a small movement larger. It is important however not to make it too large. Your movement should not be "big". Rather, it must be complete. It must explore the full range of motion so as to train you as productively as possible within that range of motion. Consider for example that there is scope for short punches on makiwara. But if it's all you ever do - ie. 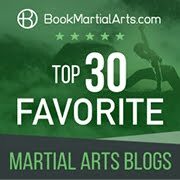 you always avoid a full reverse punch against a makiwara on the (incorrect) assumption that "I'll never wind up for such a punch" - you'll be missing out on practising full power punches. Sooner or later you should practise a full punch - one where you get to wind up for maximum acceleration. Sure, you might not get the luxury of such a power hit in real life. But training half a movement on the assumption that you this is all you'll ever launch against an opponent is selling yourself short. (as I've discussed in "Whole lotta shakin': pre-loading the hips", "Whole lotta shakin': an addendum" and "The importance of flow"). No, the double hip is seldom about literal application (as impressive as some make it look when punching pads or bags). Rather, the double hip is about deliberately giving yourself the opportunity of exploring a larger hip motion - a full range of hip motion. You pull the hip one way so that you will have a maximum range of movement in the other. And pulling the hips both ways means you get practise in both directions. Readers might recall from my article "The importance of flow" that I reserved my most scathing criticism of the double hip for its use in kata. Essentially my view remains the same: you won't be applying the double hip literally and it shouldn't be in every movement in every kata. Kata contain movements that are contextual and shoving a "double hip for added power" into every such movement interrupts that context. Indeed, it can rob the kata of important information - all in the drive to "add power". There is much, much more to karate than "hip power"; the interconnectedness of related movements is one, the need to utilise the momentum of your step is another. Katsuhiko Shinzato of Okinawa Shorin ryu performing naihanchi kata with "koshi" (hip) pre-loading. And I can understand this approach: the kata is being used as "heishugata" (literally "closed fist" form): ie. it is a fundamental training platform more than a collection of applications done sans partner. Personally, I like to use naihanchi for its applications - ie. I prefer to see it as a "kaishugata" (literally "open hand" form). But I can easily see this kata fitting the mold of a fundamental training form - what sanchin kata is to goju, tou'on and uechi ryu - where the kata is used less for application and more for training fundamental skills (such as use of the hips). So where do I stand? I'm happy to train hips. But I draw the line where this is seen it as the "correct" or "only" way of doing kata (which is how it is being touted by some). There is much more to kata than hip training. I remain generally opposed to pre-loading the hips in kata moves unless the load is contextually appropriate and throws a technique at the same time, ie. a technique is applied as the hip turns one way and another is applied as the hip turns another way - see my video below. But my view pre-supposes the kata is used primarily as a kaishugata. If it is heishugata - well then, it serves a very different pedagogic reason. And who is to say that there is only room for kaishugata? Indeed, my own sanchin practise is more about fundamental principles (like grounding) and less about application. I say this even though I've recently been experimenting with more functional movement in sanchin (I'll be writing an article on this in the near future). For the time being it suffices for me to say that during the bulk of my martial arts career, sanchin kata has been purely heishugata - fundamental training of the body. Indeed, even though I always spoke of naihanchi/naifunchin as a practical form, to be truthful I never really practised it as such until fairly recently. It was a heishugata for me too: I used it to train stability in stances, be it "mabu" (a narrower horse stance) or twisted stance etc. I used it for good structure and alignment. I used it to develop core strength and flexibility. I didn't really use it for application other than in one or two moves. Yes, I now see a host of stunning applications from this (apparently "basic") kata. But for most of my career it has functioned (quite efficiently) as heishugata: kata for training the body. And I can see why: on the surface, naihanchi doesn't seem to lend itself to application very well. At least not literally. Rather, you have to examine it from a stem-cell movement perspective to see its potential in application; you have modify angles, projections and vectors to see that one move is being used to convey multiple meanings (hence my reference to "stem cell"). The biggest problem with naihanchi is, of course, the very formal sideways stepping. You see, people don't tend to "fight" sideways. Not literally anyway. It's true that they might position themselves sideways in an isolation exercise: as an example, one need only look at Higaonna Morio Sensei when he strikes makiwara. Yes, he starts out in a standard reverse punch, but I don't think it's an accident that he gradually moves to an increasingly side-on stance with a punch that resembles a kagi zuki (hook punch) from naihanchi: in terms of maximising his range while isolating the punch dynamics, this is quite understandable. He's training in the manner of heishugata - not literal application (kaishugata). 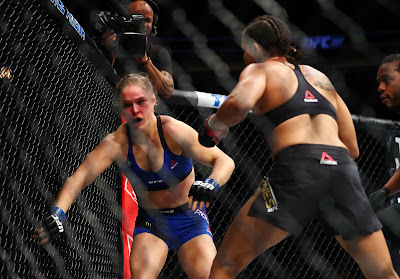 While sideways punching might still seem theoretically possible in a fight, sideways hip action is arguably even more problematic; the restrictions of the literal sideways stance make it hard to get full mobility and use of your hips (as opposed to facing an opponent directly front-on). Also, I've previously mentioned that the use of koshi in naihanchi/naifunchin can actually set up a "wave interference" that pulls power away from the hook punch. Consider the video Katsuhiko Shinzato performing naihanchi shodan and in particular note what happens to his punch at 0:15 and 0:26. If you look carefully at those two points you'll notice how his hip appears to be pulling away from his punch just as it is "landing". However even if I'm wrong (ie. the punch is landing before the hip pulls back) I can't help but wonder just how effective the hip use is at such an angle were it to be applied literally... How much force is directed outward and how much is being reabsorbed by the "rubber band" hip action? If you had to examine the movement entirely from a literal application perspective, the hip use in this type of naihanchi/naifunchin practise places great emphasis on the "flick back" - where in reality all you want to apply force is a "flick out". This is not dissimilar to the point I made in my article "Details, details" in relation to the inverted punch in saifa; in my opinion you can't punch side-on and use the hip effectively. Mostly all you'll succeed in doing is pulling the hip back as you are striking. To the extent that you manage to use your hip, it will be a mere "flick" - hardly comparable to a reverse punch (gyaku zuki). Accordingly in my opinion hip use is always going to be problematic for sideways movement. Added to this is the fact that hip use (especially the lateral rotation) is only one way of increasing applied force. In naihanchi/naifunchin you can gain a lot of momentum through the movement of your whole body into the attack (see the pictures to the right by way of example; I deflect the kick and then move my whole bodyweight into my attacker, hitting him with the hook punch as I do so). You'll also note that in saifa the hand isn't turned over; the punch remains inverted. This suggests to me that your body simply must turn into the attack. In naihanchi/naifunchin the reverse is true; your hand goes into a hook punch, turning over so that it is palm down and moving in an arc around your body (see the picture at the top of this article). This ties in perfectly with a sideways momentum. But as I have argued previously, the above discussion is only an issue if you consider the movements in naihanchi to be literal applications. What if you're using the kata as platform for training hip rotation? In that event, I suggest that all of the above concerns become irrelevant because they are all predicated on the basis of a kaishugata - not a heishugata. Sooner or later you have to learn how to use your hips. And who is to say that there is a better way to learn to control the hips than than in sideways isolation in naihanchi? After all, if you can do it naihanchi, you arguably can use your hips anywhere. In some respects, the formal and isolated nature of naihanchi is the ideal platform for hip training, if you choose to make it so. 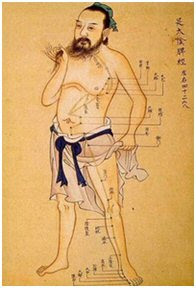 I once asserted that the Chinese arts from which karate was likely descended or was influenced (eg. the ngo cho kun / wu zu quan, bak mei, yong chun white crane etc.) all use contextual hip loading. I argued that the same is true of the internal arts of China, not to mention long fist northern schools (from which some believe shorin-ryu is derived). In other words, in these arts practitioners don't pre-load their hips; they use them naturally where the context allows. But I've discovered that this isn't true. Certainly white crane has a lot of "shaking" (particularly in "shaking crane"). Really this is no different to the "koshi" of karate (although both sides might have something to say about my assertion, I'm sure!). I have tended in the past to see attempts to add "koshi" training in kata as an an unhappy marriage. 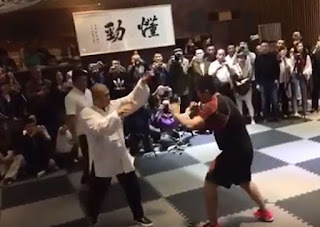 Relevantly, I noted that this kind of action is absent from Yong Chun white crane as well as other crane-related arts (such as ngo cho kun / wu zu quan) which are closer to karate (certainly Naha-te) than other extant forms of white crane. But that isn't really true. Look a bit closer and you see "shaking" emerge from hip isolation practise in many arts that are arguably related to karate. So I must concede that my previous historical arguments against "koshi" are unfounded. Hip mobilisation seems to have been around in one form or another for a long time. 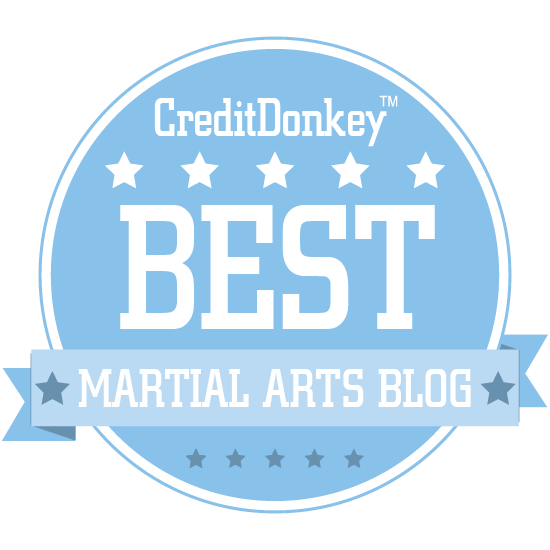 "It is very important to understand that only a small number of Okinawan martial arts use this whipping energy to a significant extent, but all Okinawan karate uses (or should use) "structural" gamaku." 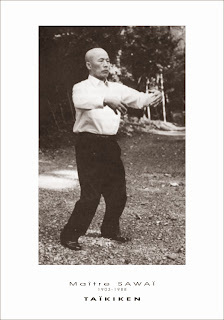 Yes, it's possible that karate always had a "hip mobilisation" aspect in kata like naihanchi: that many have forgotten this in the development of the art from its early Chinese influences. 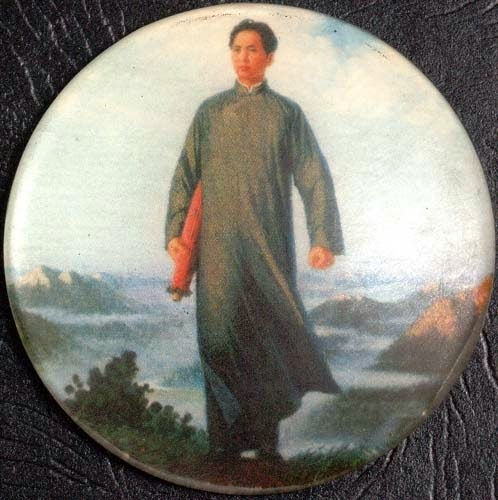 But I believe that, as with many southern Chinese "relations" to karate and even its rumoured northern relatives, hip mobilisation exercises are still a relatively small part of traditional forms (ie. "kata"). Yes, you can and should learn to use your hips. It's just that there is a whole lot more to martial movement than learning how to use your hips, as important as the latter might be. And I don't believe it is necessary to add hip loads to all your kata moves anyway. Yes, you might develop very powerful hips, but I've managed reasonably well in this regard without making all my kata about hip mobilisation. I demonstrate a hip movement using sanchin: note my pre-load in this isolation exercise. In the end, I think that kata is whatever you want it to be. For me, it is more than just "principle" or "fundamentals". It is also about application. In other words, it is more than "heishugata"; it is also "kaishugata". It is about actual technique; about teaching your body how to connect various movements. It is about motor learning, proprioception and kinaesthesia. Yes, part of the above is learning how to use your hips. And if you want to use a particular kata (or all kata) for isolated hip mobilisation then this is valid. Indeed, many schools have done so traditionally and many will continue to do so. Naihanchi/naifunchin is arguably a kata well suited to this task. It might even have been intended to serve this sort of function. While the same cannot be said of all kata, I think that it is fine to have an "across the board" emphasis on "koshi" - provided you have some other means of inculcating other techniques, especially those that rely on flow and connection between movements. There is no one road to the top of this mountain we call martial arts - merely preferred paths.